By the early Renaissance, scholars were desperately seeking methods to improve their memory in hope of elevating intelligence and accelerating enlightenment. At the forefront of this quest was the 14th century Majorcan philosopher Ramon Llull who developed a system of logic known as the Ars Magna (or Great Art) of logic and memory. Known afterward as Lullism, his memory system was inspired by ideas he learned from studying translated Greek astrological and architectural treatises. Llull considered the mind a kind of architectural space or theatre where symbolic images could be placed in specific locations as an aid for memory. He would enter a state of deep relaxation or meditation - lulling himself into a dreamlike trance by humming a lullaby - so as to imagine what he called the 'theatre of the mind,' This dream theatre would then have different rooms (representing classes and subclasses of information) where symbols could be stored and retrieved by simply walking down halls and up stairs into the right room. As it was expanded by later Renaissance philosophers, particularly Giordano Bruno, and combined with other memory techniques by Cicero and Aristotle, Lullism evolved into a method describing the mind as a 'universal theatre' within which 'the great book of the universe' could be reconstructed and re-membered. For instance, within a given room knowledge symbols could be placed at specific locations to mean something special or logically grouped together to impart more complex concepts. These mental objects might be placed near a window to appear brighter, and thus more important, or color coded to correspond to items in other rooms. In more advanced applications, symbols could even be imagined to animate or act out an idea like a scene from a play. Even the most abstract concepts like music could be represented in this fashion, contributing to the development of symbolic music notation and leading to the discovery of vertical chord harmonies in pitch space. - Jean-Phillipe Rameau, Renaissance music composer and theorist. In this way, memory became a kind of dollhouse art - part art and architecture, part philosophy and logic - blending virtual Limoges-like objects, figures and letters into an internal metaphysical representation of the outer world. As medieval alchemists came to embrace Llull's system, it grew into the 'artificial language' of geometry, color and positional patterns characteristic of alchemical texts. And as the practice of alchemy was eventually replaced by Isaac Newton's objective science, Lullist symbols, relations and classification techniques became a universal language for physics and the mathematical sciences. Today, Ramon Llull is considered by many to be the father of computational logic and the forebear of all computer languages - all based in some way on his spatial visualization technique to aid human memory. But while Lullist memory techniques were once considered central to learning and education, they have all but disappeared in present day. Knowledge is no longer considered something intimately connected with memory, much less any theatre of the mind or book of the universe. Our schools no longer train individuals to assume responsibility as keepers of any wisdom, relying instead on vast libraries and now the World Wide Web. The sad truth is educators have come to presume that people no longer need to hold and interconnect a wide range of topics in their head. As a result, Lullism and memory improvement has become a dead, forgotten art. Of course, this sounds exactly like Ramon Llull's theatre of the mind. But amazingly, I had absolutely no knowledge of Lullism until well after the book was published. I had arrived at the exact same conclusion as Llull through the study of music perception and harmonic science. When I did later stumble across the Lullist memory system, I was floored by its similarity to my work and immediately began to research how the study of harmonic science by ancient Greek philosophers could have led to the art of memory. Then one day it dawned on me. Greek mythology, with its archetypal gods of nature, was in fact Llull's 'universal theatre,' developed thousands of years earlier by musical-astrological philosophers to help society remember 'the great book of the universe.' As personifications of the forces and geometries underlying harmonic physics, the Greek gods must have been designed as memory objects to help store knowledge about nature in the theatre of the human mind. 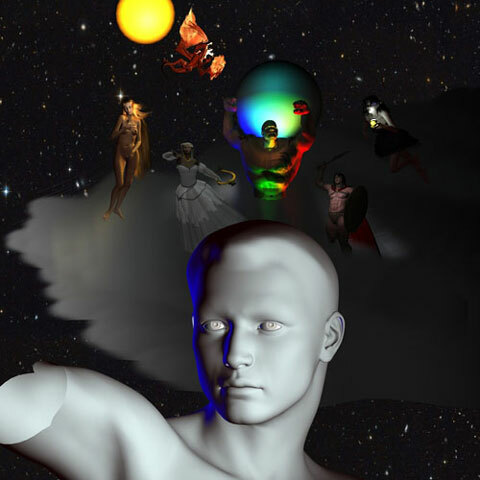 The mythical gods' ancestry, traits, marriages and affairs were used to symbolize their place in the cosmic theatre, forming a holographic and hierarchical cast of characters that could be retrieved and retold through Greek fables. Lullism was nothing less than the ancient Greek worldview, originating from the study of harmonic science and music perception just as I had found while writing my book. Perhaps it was no coincidence that Llull had been a traveling troubadour in his youth, telling stories and singing songs. In this age of quantum mechanics, it is no longer a matter of metaphysics to describe the cosmos as a grand memory theatre built of vibrant crystallized light. And as all matter resonates and combines in simple geometric harmonies to form the same musical structures at all scales of reality, our brains too are memory theatres of crystallized light. In this way, the outer holographic macrocosm is membered and re-membered by the inner hologram of the brain. Memory is everywhere and in everything. The Greeks seemed to know this. Their greatest wisdom (and perhaps today's greatest secret) is that nature stores and remembers everything it knows through the physics of harmonics. This is why Pythagoras designed his 7-tone musical scales based on the five perfect solids - to forever remind us that the same harmonies found in a perfectly resonant crystal can trigger our deepest emotions. And this is also why the Greeks designed their mythology around musical themes and harmonic archetypes - to celebrate the cosmos as the grand scientific musical theatre of God with Earth as its stage. But it will always be the people who are the actors in this passion play. As nature's very own cast of memory objects, it is still our job to help nature remember what it learns by remembering what we learn. Let us never forget that we are nature too - we are nature's memory. • Rossi, Paolo (1923), 'Logic and the Art of Memory,' The Athlone Press, London SE1 7NX, ISBN 0-226-72826-9. • Hillgarth, J N (1972), 'Ramon Lull and Lullism in Fourteenth Century France (Warburg Study),' Oxford University Press, ISBN 978-019824389.